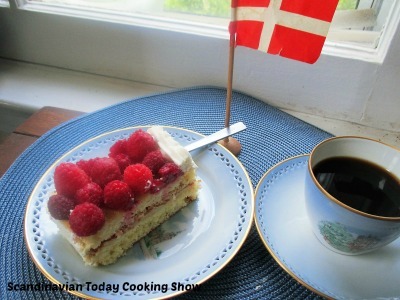 The Danish Constitution Day is on June 5th this year. So we thought it would be fun to make a two layer Danish Flag Cake with custard, raspberries and plenty of whipped cream in celebration. Dannebrog is the name of the Danish flag and it is the oldest in the world. Beat butter and sugar, add 4 egg yolks. Add milk w/vanilla extract. Add flour mixed with baking powder. Beat 4 egg whites stiff and add it to the mixture. Bake in pan greased with butter and flour at 425F for approx. 15 min. 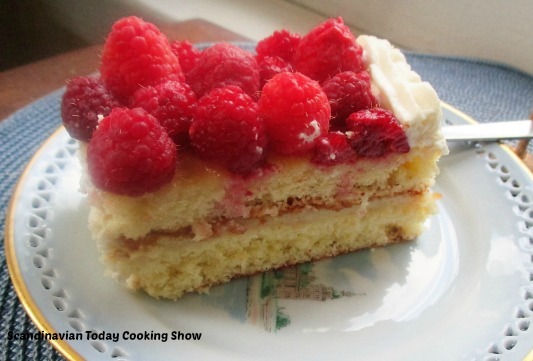 Cut cake in half, add custard between the two layers. 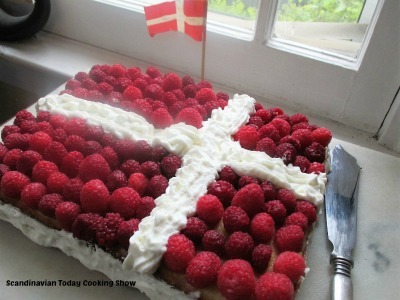 Add frosting to top layer and place raspberries to form flag with whipped cream forming a cross. Enjoy a slice of cake with a cup of coffee. The Swedish cupcakes is full of custard, jam, marzipan and loads of whipped cream! You will definitely get a mouthful to enjoy! 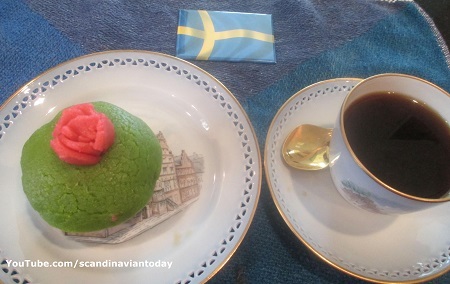 See our YouTube video to prepare the Swedish Princess Cupcakes. The cupcakes needs to be refrigerated until served. Ideally the cupcake should be eaten the same day it is made. 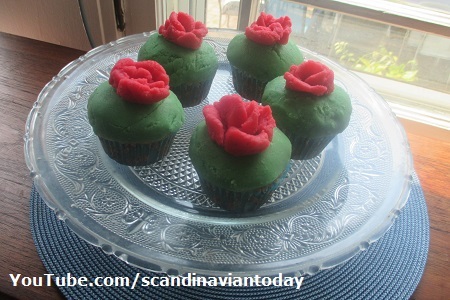 Hope you enjoy the bright green cupcakes with the adorable marzipan roses. 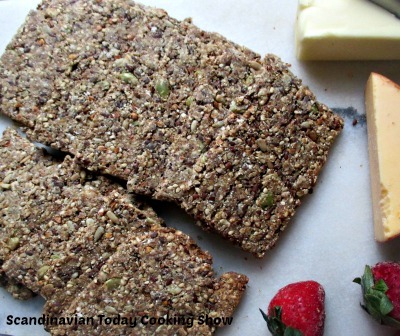 You might want to make these during Prinsesstårta week.